Life was more than a little busy this week with me finishing up the final edits for my book, Jesse prepping for a big case, two of my children being sick, and all of us preparing for the big bridal shower we’re hosting this evening. So other than buying things for the bridal shower tonight, I didn’t buy any groceries and we just ate from the freezer and pantry. We did get some great deals at Office Max, though. 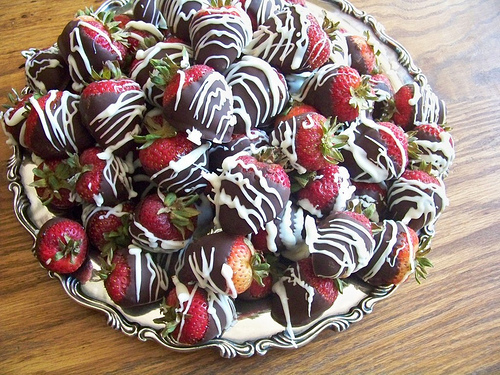 And we bought a bunch of strawberries to make chocolate dipped strawberries for the bridal shower. They were $0.88 at Aldi this week, so we price-matched at Walmart and got 10 packages! 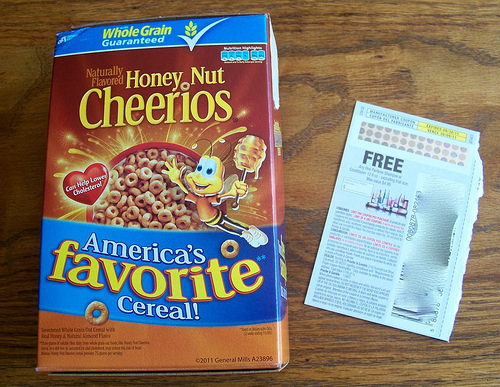 We also got two fun freebies in the mail yesterday: the free sample box of Honey Nut Cheerios and the free Pantene Shampoo or Conditioner coupon. We’ve been experiencing weeks of intense heat here in Kansas. With three young and active children, the heat has provided a challenge as they can’t go outside and play for long stretches of time. So, everyday has been exercise in creativity (and sometimes patience!) as I wrack my brain for new and interesting indoor activities to keep them occupied. Earlier this week, I was feeling rather uninspired when I spied my stack of magazines. 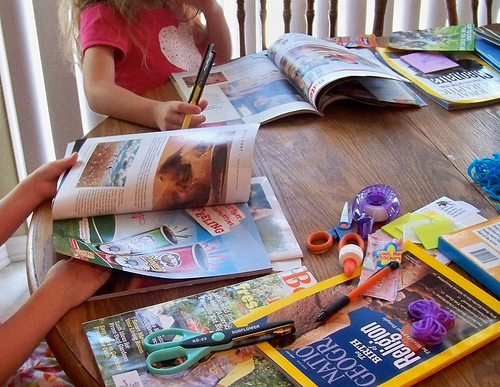 I pulled out a few issues that were getting ready to head to the recycling bin, got out scissors, glue, and other craft supplies and told them to make a page of all their favorite pictures. They had a blast and it kept them busy for quite a long time. Best of all, it cost me nothing as I used things we already had on hand. What fun & frugal activities have you been doing with your youngsters recently? I’d love get some new ideas to add to my list! 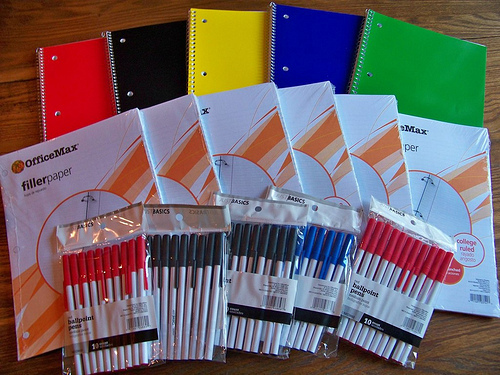 I love new school supplies just as much as the next person. This time of year I find myself stocking up on what seems like an endless supply of pens, tape, and post-its. However, I was able to pick up so many great deals that I had more than I needed. 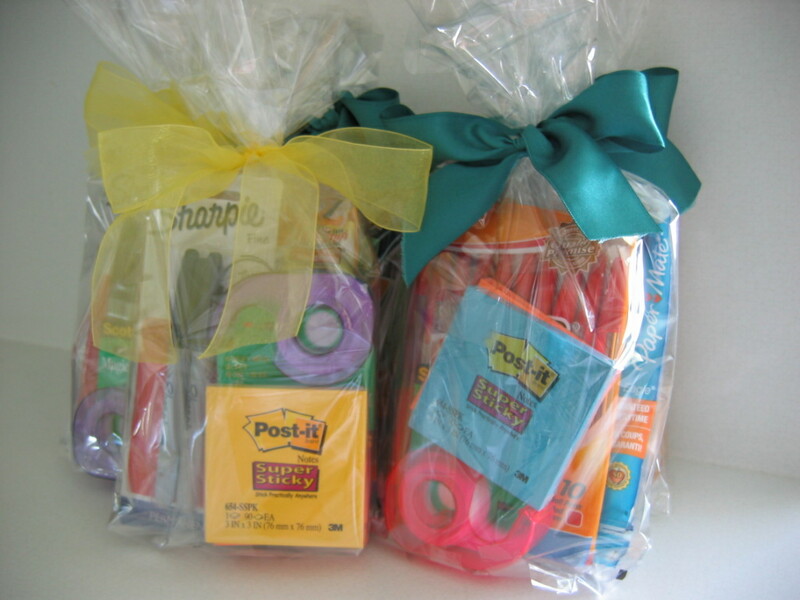 So I decided to put together “Back-to-School” kits for the teachers at my son’s school along with a note wishing them well for the up coming school year. AboutOne — an online organization tool for home managers — provides one place to organize your family’s health, education, and possession records and precious memories and syncs your information with its calendar, address book, document filing, and reporting tools. You can access your information from your phone, a computer, or any other device with Internet access, no matter where you are, whenever you need it. All your information is stored with bank-level security. Always forgetting things? You can set up your account to give you alerts and reminders. Plus, you don’t have to worry about losing your information in case of a computer crash; AboutOne expertly handles backups and security for you. My favorite thing about AboutOne is that you type in little daily memories. I’m not very good about keeping journals or baby books (okay, confession time: I don’t have baby books for any of my children. I tried with Kathrynne and never even finished the first few pages, so I finally gave up and now just stick with doing photo books! ), but I always wish I had an online place to keep track of the funny little things my children say, the milestones, and all those things I don’t want to forget as a mom. 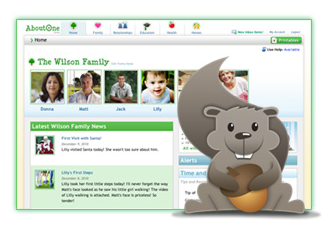 I was excited to see that AboutOne can be a sort of online baby book–I can type in a short little memory or funny saying or milestone from the day every day on AboutOne. For someone like me who can’t seem to figure out how to pull off the baby book thing (all you moms who update your child’s baby books consistently are my heroes! ), this is a wonderful way to still not forget and feel like I’m at least doing something to remember these precious moments! Want to try AboutOne yourself? You can get an absolutely free one-year subscription right now. Just use coupon code MSMFREE and it will take off the purchase price of $30. This code is good for one free AboutOne subscription and doesn’t expire until August 12, 2011. 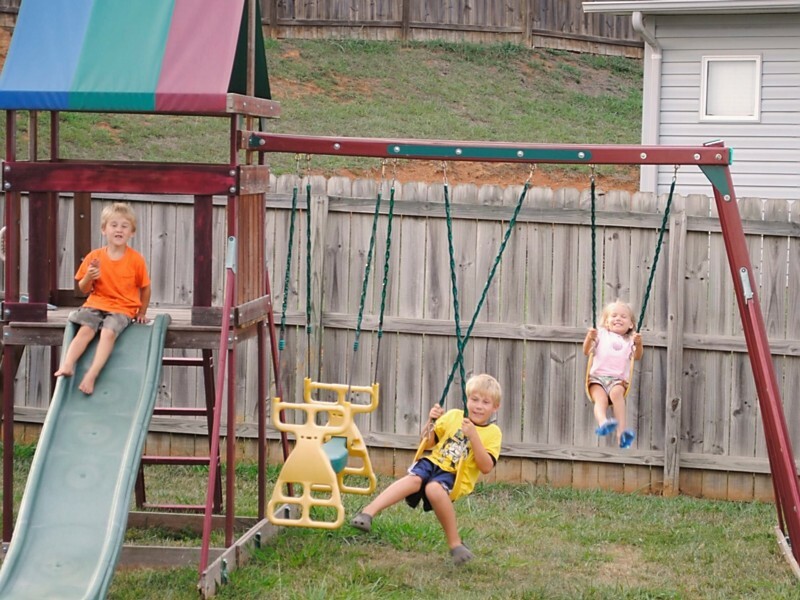 Last fall, I sold the Little Tykes backyard playset that we were quickly outgrowing. We needed (and used) the cash for a Thanksgiving trip to visit family who live far away. I was hopeful that we could save enough for a larger, sturdier, wooden playset this spring. It took us a bit longer because of unexpected medical needs, but last week we were thrilled to have our new-to-us swing set and fort installed. Great Grandma gives each child $20 for their birthday and we had three birthdays from January to May. My oldest son opted to give his birthday money to the missions project at VBS, but the rest was saved for the swing set. Great Grandma sent us a bit extra, too, which was also applied to the fund. Thank you, Nana! In the ongoing effort to purge, I listed and then sold several knick-knacks around the home on Craigslist. We capped off our swing set savings fund with $55 earned when we included items at my mother’s garage/moving sale. 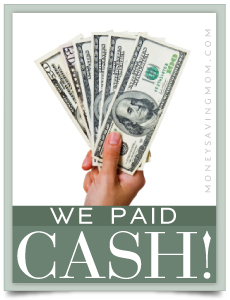 After watching all the sales and pricing swing sets at home improvement stores, Walmart, and Sam’s Club, I determined that purchasing brand-new was just too much for this single mama’s budget. My next step was to scour Craigslist, which I did. The very few that came available in our area were overpriced extremely worn and needing repair, and/or looked overwhelming to relocate and construct myself. I had just about given up the idea (and almost convinced my children the park was just as good), when a friend made a passing commenting about her children getting a new trampoline because they had outgrown their swing set. *Ding *Ding *Ding! Sure enough, she was willing to sell at a great price because she was grateful for the yard space. And to top it all off, she convinced her husband to haul and set up the new-to-us swing set at our house! Surprised to find herself in the role of single mother, Missy is a hard-working optimist doing her best to enjoy life and demonstrate Christ’s faithfulness in this not-so-perfect world. 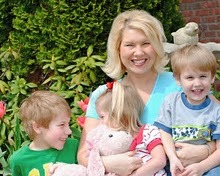 Three little ones provide joy and purpose along with many “growth opportunities.” Missy blogs about the adventures and pitfalls of life at Far From Flawless. Remember that these coupons are only good through July 31, 2011.